If you administer a small network at work or at home, you'll welcome the free SoftPerfect Network Scanner. Its set of tools will warm the hearts of small network administrators. Want to discover every device on you network? Get details about IP addressses? MAC addresses? SoftPerfect Network Scanner does that for you, and more. 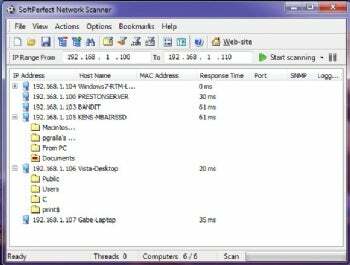 The free SoftPerfect Network Scanner provides an excellent suite of tools for administrators of small networks. In addition to providing basic information, SoftPerfect Network Scanner is a great tool for uncovering potential vulnerabilities. It shows you all of the network shares on all devices, so you can see whether there are any that should not be shared. It also scans for listening ports and SNMP services as well. There are even more sophisticated tools, such as remote shutdown. The program also supports Wake-on-LAN, and can launch external applications. If you manage a small network, SoftPerfect Network Scanner well worth the download.